Time flies by so quickly these days. Especially since I count my time by how many minutes are left before I get another life on my two new addictions: Candy Crush and Pet Rescue Sagas. You may think I am kidding but it I have found myself planning chores and food prep around the minutes before I receive a new life on these computer games. Addiction, you bet! On the other hand my friends and I have been doing some traveling to the northern part of Nicaragua to an eco-reserve outside of Estelí called MiraFlor. This is an agricultural area that not only produces a lot of food supplies but also has an amazing amount of epiphytes, orchids, bromeliads, hybiscus and so many other plants that I couldn’t recognize and didn’t have a pad and pen to write the names while hiking. There were four of us happy travelers from Rancho Santana–Bill and Dolores Watson from Reston, VA, Barb Wisley a full time RS resident, and myself. We had a ball with a tailgate picnic on the way to Estelí. 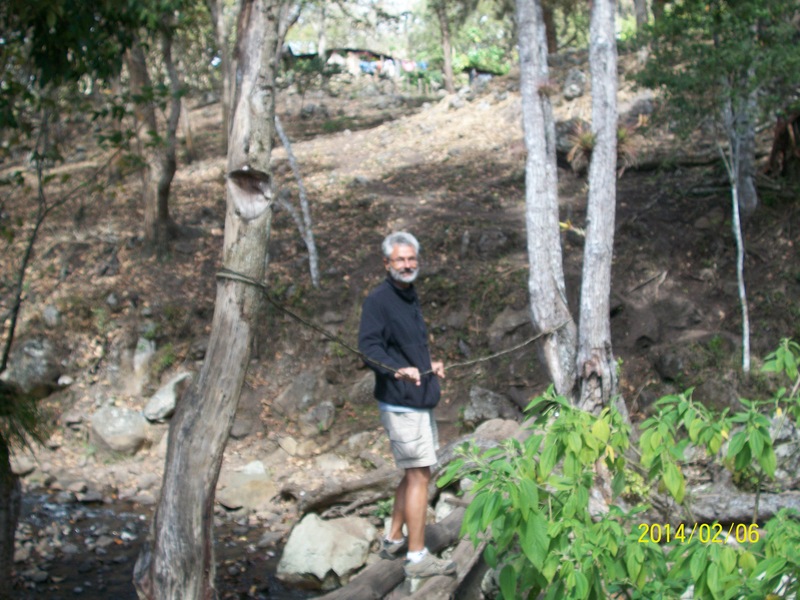 We stayed at a somewhat primitive but beautiful place called Finca Nebulina del Bosque in the middle of MiraFlor. 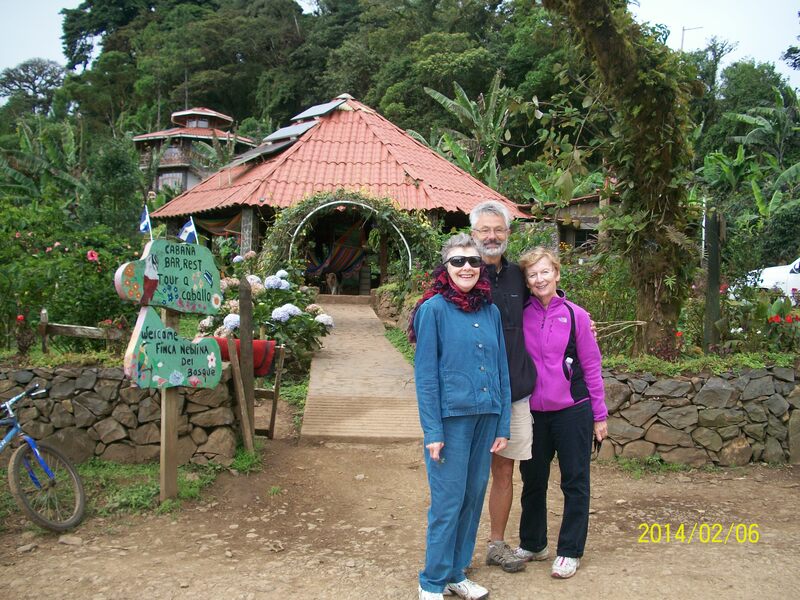 This Finca is owned by a young couple, woman from Germany who worked in Costa Rica and met her Nica husband there. They have a five year old son and are very proud of their farm and their work in MiraFlor. I’ll attach some photos of the area at the end. We hiked around the perimeter of the farm and one day up to a waterfall where I walked across a log bridge that had a guide rope to hold on. Yes, this Doña Margarita wasn’t going to miss out on getting close to the waterfall because the way was either across the running water of the creek on the stones or the log bridge about 15 feet above. I figured the safer way was the bridge. Barb thought she had a picture of me on the bridge but she didn’t. Only photo of Bill on the crossing which was a riot. He only went about five feet across the log and turned around because the guide rope was swaying. I showed him how to side step and push on the rope to keep it stable, so he followed me across. Barb and Dolores took the rock road and got their shoes wet. I was afraid of slipping and falling that way. On the way home we stopped at one of two organic cigar factories for a tour. 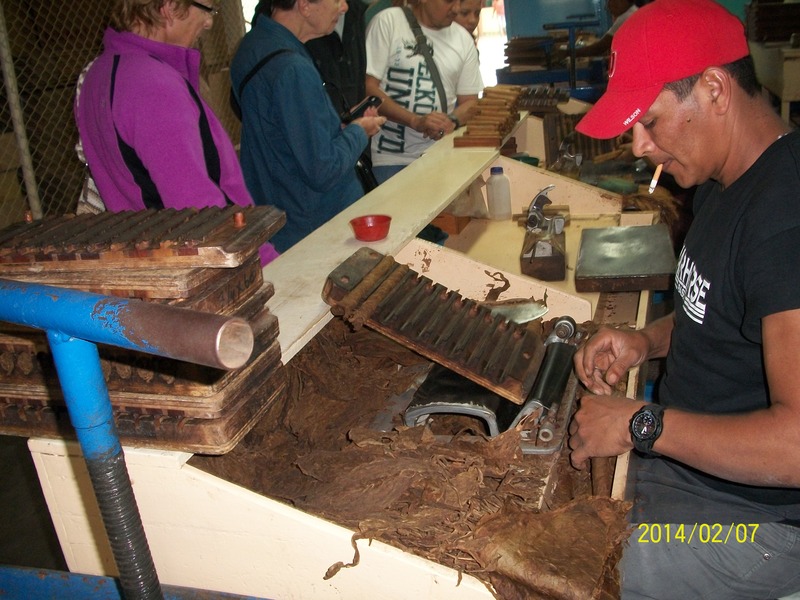 We had arranged for a guide who met us in Estelí and took us through the whole cigar making operation. I’ll attach photos from there as well. This factory rates #13 in Cigar Afficionado magazines out of 25 factories and is somewhat unique in that they do the whole process at the site including making the cigar boxes. That was a two hour tour well worth the $1/per person price. 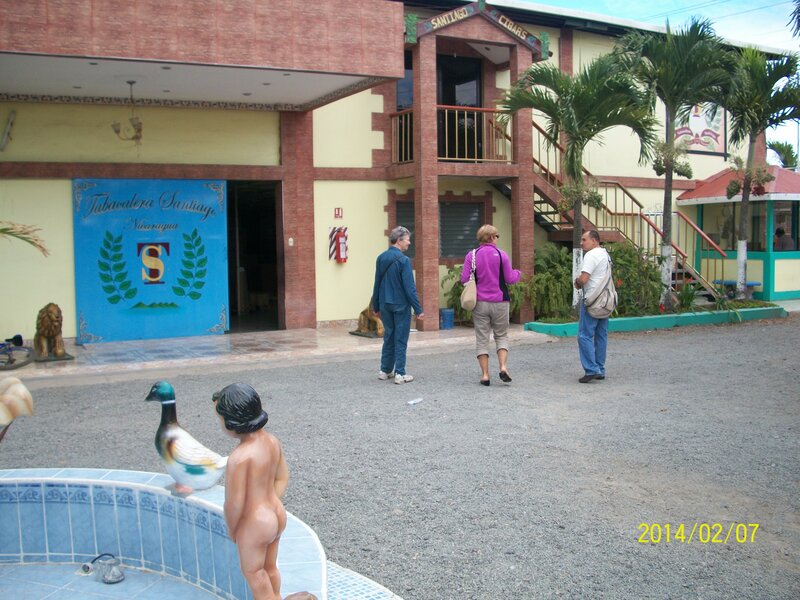 Maybe you would be interested in some of the differences in costs here in Nicaragua. The items that are about the same price as in the US are autos, fuels, utilities, phone. Items that are a whole lot cheaper are food, drinks, clothing, housing, some household items other than appliances, maid and any of the service related categories such as healthcare and insurance. My premium health insurance that covers almost everything imaginable including medications at the Vivian Pellas Metropolitano Hospital in Managua is costing me $702/year. My Medicare and Kaiser cost $325/mo. in the US. Attorneys here charge not by the hour but by the task. My residency cost me $500 plus another $200 for translation of documents. My land attorneys–one for the process to confirm title etc. from the seller, and my attorney for the registration, documentation and verification for tax purposes–cost $350 each. If I had had to pay by the hour at US prices, I would be looking at a $10K bill. Professionals in Nicaragua are still among the lower paid individuals which is why they have been subjects of corruption in the past. In the 9 years–yes, I have been coming to NI for 9 years–I have seen an honest attempt to increase wages for professionals and educated individuals in the service industries. There is still a long way to go, however, to make salaries more attractive for qualified candidates. When you consider that there is still a very large proportion of the population that is illiterate, you can see that there is a way to go before there is parity among wage earners. The commercial project in Limón #2 is still in the cooking stage, although I do believe that I have one confirmed investor. Now I just need five more. Every week I hear of another person who can hardly wait until the project gets off the ground for their use. Cuidadores de Personas is also in a slight holding pattern. I have given up trying to push rocks uphill to market now six certified cuidadores for hire and to encourage more individuals to take the course and become certified. Next week I have a meeting with the manager of medical tourism at the Vivian Pellas Hospital in Managua to discuss the Cuidadores de Personas program and we will see what comes of that. Perhaps I can do a train the trainer type of deal for them. Not sure and not worried at this point. Timing as we know is everything. In the meantime, I am having a good time just being here with a new challenge everyday or a new chance encounter with an interesting person, or always my addiction to keep me off the streets–and I use the word streets loosely. Oh, my latest endeavor here at my house is my indoor jardén/garden. I figured if people can grow pot in their homes in CA, I should be able to grow basil and Italian oregano in pots in my second bedroom. I have my little buckets and am making compost on a very small scale and the seeds that I brought from the US are loving the soil. The sprouts are only a week old so I’ll see how things progress. I have to be careful that I don’t love them to death. I also want to report especially to Marjory Clyne, Christine Evanson, and Theresa Mnich, my previous house guests, that I now have a fully screened house. No more fears of cats, snakes, tarantulas, mosquitoes and large insects coming to visit day or night. Surprisingly the screens also cut down a lot on the polvo/dirt from the road, although I still keep the windows on the road side of the house closed during the day when the local nutcases and surfers drive by like crazy without consideration to the dirt and respiratory infections they are creating for the villagers. Leah is taking over the property management of my house in West Sacramento. And the house is up for sale since January 3rd. No offers as yet but a lot of online action. I trust that it will sell for the price I want. Perry Palamidessi, my Coldwell Banker realtor, isn’t discouraged nor am I. The frontyard farm is still producing a lot of great veggies, the spa is painted, the pond and waterfall are working and Felice and the two fish are growing and entertaining my tenant. All is well. Not much else to report. Take care of yourselves. One of my dear friends from grammar school, high school and also an MSN passed away this month. Her transition reminds me that we are all more fragile than we think. Dinner adorned with orchid from the garden. 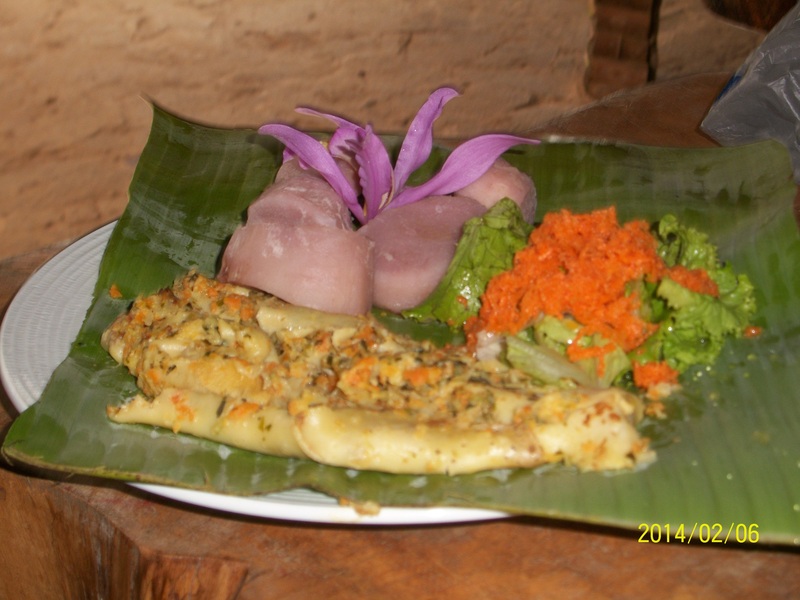 The lavender colored food is a yucca like vegetable called quisquiscue. Tastes like potatoe. 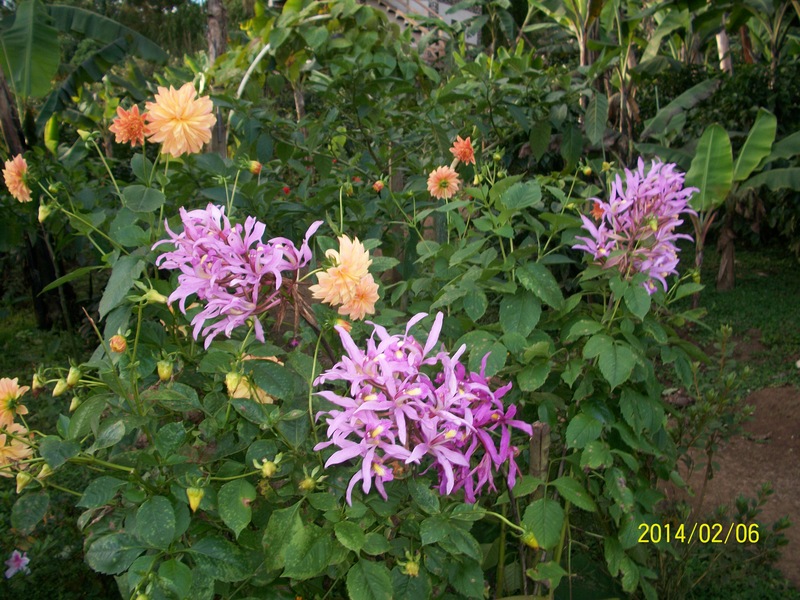 Finca Nebulina del Bosque garden with orchids, dalias, asters and tons more flowers. Every meal had a flower in the midst. Dolores collected a vase full in our two days there. Guy with the cigarette is a “packer”. He takes the rolled cigars and packs them into the form where they are pressed for uniformity and compression of the cigar before the banding and individual wrapping prior to boxing. The workers are allowed to take three cigars per day for themselves. This guy must be a real smoker. Bill on the log bridge. It was about 30 feet across to the other side. Front of the Santiago Cigar Factory.